PR: Jimmy Blackman left City Hall and launched his own firm. Now he’s formed an unusual partnership with an established one. Jimmy Blackman was out of a job when his boss, former City Councilman Dennis Zine, lost his race for city controller in May. So Blackman, who served as Zine’s chief of staff, did something that’s fairly common. He formed a public affairs company, Jimmy Blackman & Associates, last month. He quickly signed up six clients that have some kind of business with City Hall. Then he did something that’s not at all common. He announced a partnership with Dakota Communications, a public affairs firm in West Los Angeles, in which they’ll share space and some work but not much else. He set up his office inside Dakota’s headquarters, but he’ll maintain independence by keeping his own clients while providing some services for Dakota clients and having that agency provide some services for his. Of course, most partnerships are either closer – one buys the other – or more distant. For example, two complementary firms maintain independence and work in separate offices but refer work to each other or work together for a client on a project basis. The Blackman-Dakota partnership is kind of a hybrid. By working out of the same office, Blackman and Dakota’s partnership will allow them to augment each others’ areas of expertise and gives Blackman use of the office at Dakota, said Kerman Maddox, managing partner at Dakota. Dakota, headed by partners Maddox and Rick Taylor, began in 1996. They have corporate, government and political clients such as Citigroup Inc., Los Angeles Department of Water and Power and U.S. Rep. Maxine Waters. The partnership will not remain static, however: Blackman uses the marriage metaphor, but Maddox talks more like it’s a courtship. “We had a series of conversations where I thought about joining their firm as an employee or doing my own thing, and we ended up coming up with a hybrid,” Blackman said. So outside of the shared office space, the two will continue to function as separate companies. How they split billing for joint work and new clients remains under discussion. Eric Garcetti when the mayor was council president. Gershwin said it’s a business that doesn’t require a lot of startup cost and is based on relationships with an ability to work on policy. “Your intellectual capital is worth more than physical capital,” he said. Blackman has more than 16 years of experience working in city and state government. 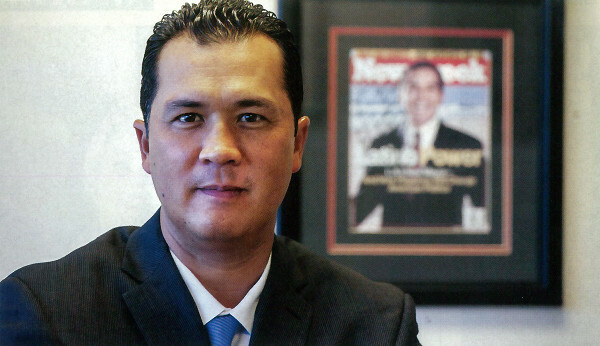 Before working for Zine, he served as deputy chief of staff to former Mayor Antonio Villaraigosa. Blackman has one part-time employee, who works from home, but plans to hire a full-time employee by the end of this month. Blackman rents a desk at Dakota’s offices in its modern low-rise building and his employees will either join him at Dakota or work off-site from a client’s office. His clients are Panda Restaurant Group in Rosemead, Delson Investment Co. in Beverly Hills, United Firefighters of Los Angeles City, Westin Bonaventure Hotel & Suites in Los Angeles, KABC (Channel 7) in Glendale and the Hotel Association of Los Angeles. He is on a monthly retainer with all six clients, who all have some business with City Hall. For KABC, Blackman said he will be working with the community affairs team such as scouting locations for events like the annual Spark of Love Toy Drive. Frank Lima, president of the United Firefighters, said he wants Blackman to help brand the organization and improve written communications with city council members. “We do the best we can, but we don’t have that key background in politics,” Lima said. Michael Czarcinski, managing director of Westin Bonaventure, said he believes Blackman will be a valuable representative of his interests.